Plug-in Hybrid? Yes but what about a Plug-OUT Hybrid? A small inverter connected to the batteries will provide 240V a.c. which can power a house for hours. This feature will augment the battery pack that off-grid P.V. systems will have anyway. When electric cars go mainstream the grid will bid for their stored power via smart meters. A parallel hybrid will always be able to sell power when the price is right and still make the next journey. The batteries can be kept topped up by the 9bhp petrol motor charging via the electric motor on the other end of the power shaft. Extended power cuts won’t be a problem. The vehicle can deliver d.c. and a.c. power wherever it goes. The range of power tools that can be driven is endless and this will empower trades people and farmers alike. It just takes an extra pulley on the power shaft to provide drive to anything bolted to the rear luggage rack. The picture here shows a compressor but it could be a lathe, a potters’ wheel, a wood chipper, a water pump ….. etc etc. A rear p.t.o. is also easily arranged for light duty mowing, for example. No problems with lighting and cooking when you go camping in a Plug-OUT Hybrid. The Honda GX petrol motor takes just minutes to refit into a go-kart and it’s already modified with racing parts to suit. If ever there was an automotive Swiss Army Knife this is it. OK – so the next automotive era has arrived and all car makers now offer some variation of an electric car. However, despite thousands of people with free home-brewed solar electricity just itching to go electric there is nothing economically viable on offer. Here then is an attempt to define what would be a workable, even desirable, alternative. A lot hangs on the price. Anyone paying the London congestion charge could be paying an additional £2,000 a year. If one spent £10,000 on a vehicle that was exempt it would immediately give a return of 20% on capital so that suggests what the lowest price might be and even double that would still be economically feasible. Safety – very strong with above average crash sustainability. Not like a Sinclair C5 then. Seating – for 2 adults and a rear parcel-shelf seat for occasional use, children and baggage. Range – a normal daily commute of a 25 mile round trip entirely on battery power. Range – a small combustion engine to give unlimited extended mileage. Parallel hybrid – both power sources used at once if extra power is needed. Plug in hybrid – batteries charged at home or by range extender engine. Performance – equal to or faster than normal traffic. Luggage – similar capacity as any other small car and much better than a microcar. The key to economical motoring is lightness so from the start let’s begin with a 3-wheeler with two wheels in front and one behind. At a stroke this dispenses with some heavy things like a differential, axle, and one back wheel with suspension, brakes and associated bodywork. With some heavy batteries mounted low down between the front wheels there will be no stability issues. The power train couldn’t be simpler. The rear wheel spindle is mounted in an ‘H’ shaped swing arm, just like a motorcycle, with a chain drive to a sprocket that spins on the same inboard spindle that the swing arm pivots on. This sprocket spins alongside 2 others whose chains run up to the main power shaft where dog clutches engage either one to give high and low ratio drives. The transverse power shaft has a push on drive coupling on each end to connect an electric motor on one end and a small single cylinder petrol engine on the other – it’s that simple. The permanent magnet Lynch electric motor produces maximum torque from a standstill so there is no need for a clutch. It also doubles as the starter motor for the engine, a regenerative braking charger and can run backwards to provide reverse gear. Dispensing with a starter motor, alternator, gearbox, prop shaft, clutch and reverse gear puts more in the ‘saved weight’ account. Electric power is a useful 20bhp with 40bhp available in 5 second bursts. By comparison the original 850 Mini had 33bhp but weighed 70% more than our target of 7cwt. The electric motor and the 10kW.hr battery pack is sufficient for general short trips of up to 25 miles and perfect for city traffic creeping while adding in the petrol engine produces lively performance up to 60 mph for bigger trips on the open road. The slightly modified Honda 200cc GX petrol engine only weighs 35lbs and produces 9bhp; adequate for performance boosting, charging, range extending and even as a limp home device. It can be replaced for well under £500 (clones are £200) and after 5 minutes of unclipping could be left behind for servicing. Maximum combined power is 49bhp to give a power to weight ratio of 150bhp/ton; it will be nippy. Of course the design could have substituted extra batteries and an extra electric motor for the petrol powered assistance but the logic is that some petrol power enables the driver to set out on any journey with confidence. With an Indian made Agni electric motor (very similar to the Lynch pancake motor) this car would make great third world transport with India to start with. Tata this is your new super-cheap world car! A £100 programmable logic controller is used to control gear selection via the clutches and the potentiometer throttle pedal. Regenerative braking is controlled but limited if the rear wheel tries to lock up. The same idea also provides optional launch control and safer driving by restricting wheelspin. The ‘Range’ mode uses ‘engine +’ to drive as normal but whenever the car stops, the engine revs up and starts charging the battery ready for the next burst of power. At the first touch of the throttle the engine disengages and the electric motor stops the power shaft to select first gear. At the front end of the car a simple subframe makes a battery box with incorporated suspension mounts. A lightweight rack and pinion and unassisted brakes take care of steering and stopping; all very simple but maybe the biggest weight and cost savings will come from the novel bodywork or indeed from the lack of it. Central to the strength of the car is the passenger cell made from 2 CNC machined aluminium sheet and plywood bulkheads all connected with 3 fat aluminium torque tubes and further panels in the same aluminium and wood sandwich. The complex bulkheads enable the suspension loads to be fed into the extremely rigid passenger cell as well as mounting dozens of other components. Design like this not only saves weight, cost and assembly time but the bare aluminium looks so good that there is no need to paint it. A smaller stressed panel incorporates the dashboard where a matt carbon fibre like laminate sets off the Stack instrument panel and the selector knobs for power and varying the regenerative braking. Behind the passenger cell there is no bodywork as such; a horizontal tubular hoop supports motorcycle panniers on each side of the back wheel and a top box over the top. At the front a one piece moulding covers the battery box with a pair of wings over the wheels and partially down the side panels. The narrow central roof panel is supported by two longitudinal roll cage bars which also provide hinge points for the gull wing window/doors. Similar to a Mini Moke (and the Mercedes SLS) there are no doors as such, just side pontoons. 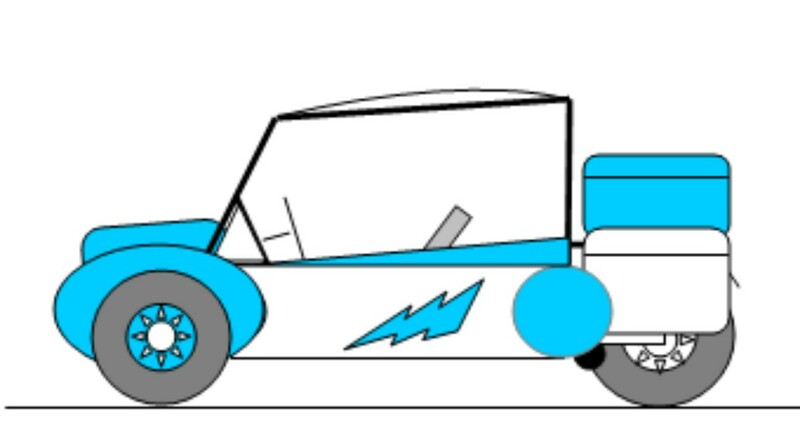 To cut out the cost of regulations, crash tests etc the car will be sold as a kit car so customers will be expected to fit the engine and the wheels, perhaps with 10 minutes of help at the point of sale. Can the price target be met? By raiding the parts bins for existing components and keeping it all minimal and simple the answer is yes. The result would be a characterful and useful eco-runabout with almost negligible running costs and at half the price of a Morgan 3-wheeler (with sales of over 1,000). The Renault Twizy costs just £8,000 but battery hire costs £55 a month and it is hardly a useful all-rounder, and anyway similar mass production would make our car much cheaper. This is just a sketch to hint at the full design. If you want to make one just let me know. Tech notes: front suspension – wishbones but none sourced yet. MX5? Usual Cortina geometry from kit car uprights. Rear swing arm – nice specials available for drag bikes at reasonable prices, just need a wide mounting to take side loads. .. easily made anyway. Wheels etc .. 155×13” tyres at front … cheap and plentiful. 165×14” at rear. Electric clutches … magnetic or dog clutches .. either would work … drag race air shifters? A lock-up centrifugal clutch needed for the engine to provide limp home mode. Roll cage; usual wide front and rear hoops connected by a close pair of tubes running from top of screen to rear and then down the rear bulkhead to pick up the engine/transmission plates. The rear frame extension is a loop of same width as the roof bars and provides a rear grab handle as well as support for top box etc. The aluminium engine/transmission plates also provide swing-arm mounts, rear frame bracing and pickup lugs for the rear coil shock absorber units – a nice CNC machining exercise. For a low car like this, gas-strut balanced self raising seats would be a nice touch to make getting in and out easier and the side pontoon height could then be higher for better strength and protection. Rear corners of the passenger cell are fitted with sprung skateboard wheels to counteract any inadvertent tipping without damaging the bodywork. The Morgan F4 used to scrape the exhaust to the same effect (only tipping after C of G was raised with back seat passengers).